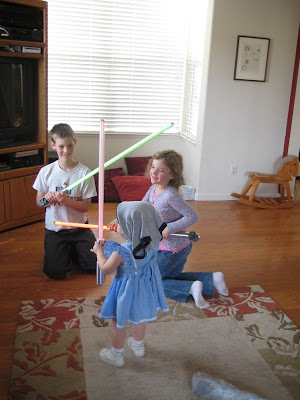 The kids were playing stars wars after school. Bekah had Jeremy's underwear on her head. It was so funny watching them run around and play with each other. 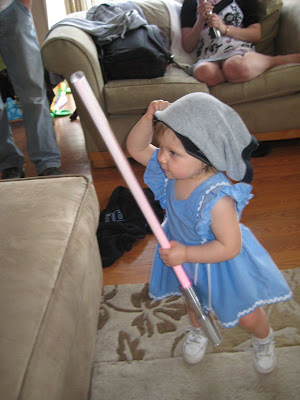 hahahahahahhaha...I think it's HILARIOUS that she's wearing an adorable little dress with underwear on her head. 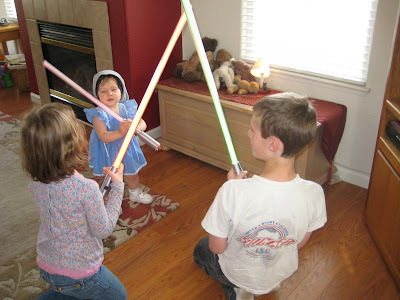 How funny that she's already playing Star Wars and she's only one! Love it! 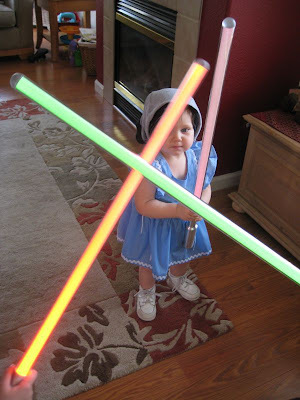 I can see that her dad is influencing her at a young age. :) My girls say they "LOVE football and Nascar". Abigail runs around the room when Nascar comes on. She asks every weekend, "Are today the races?" Ah, the influences of fathers. You can download a demo of Paint Shop Pro from the Corel website. Or send me the full-size version of your favorite photo, and I'll give it a shot.